Book your Placenta Services today! Next FREE Placenta Class will be held in April 2019 ! Sign up for any of my placenta services at the class and you will receive $10 DISCOUNT! Please contact me for class dates and registration! 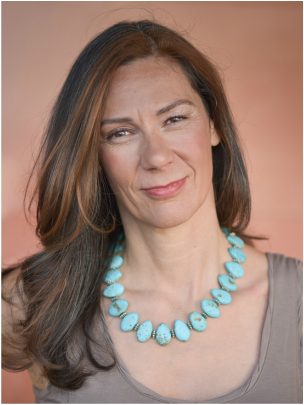 Diksha Berebitsky triple Certified Placenta Specialist with Blissful Birth Doula Services will be holding this workshop on Placenta Medicine. Just perfect for expectant parents! I am also happy to set up a individual meeting at a time of your convenience! In the meeting we will talk about placenta options, benefits and the logistics. 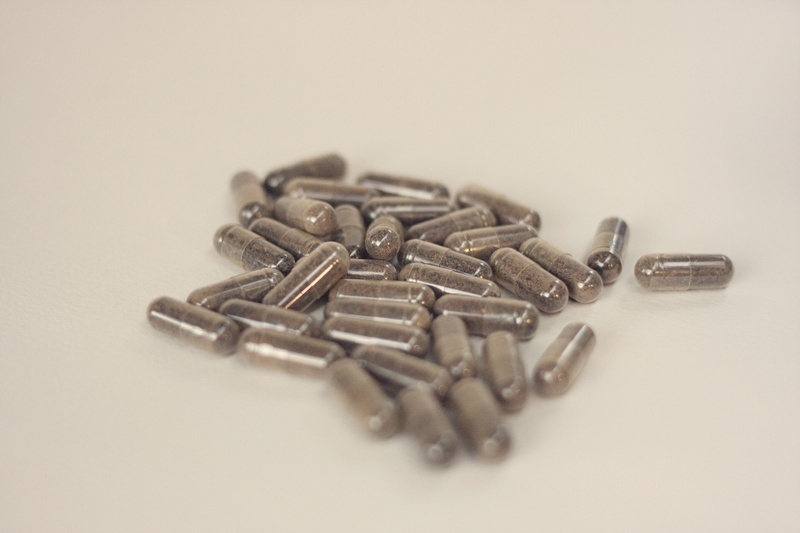 ﻿Your own placenta, made into capsules, is incredibly nutritious and beneficial to you. Women who take their placenta capsules tend to have better postpartum experiences, avoid the baby blues, have an increase in energy, and an increase in milk production. Traditional Chinese Medicine has used placenta for centuries to treat issues such as fatigue and insufficient lactation, and scientific studies have bolstered the use of placenta for these conditions. 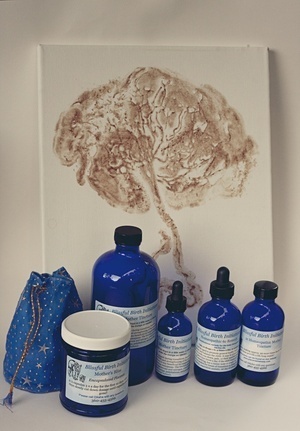 Using the placenta for your postpartum recovery is a very easy and natural way to help you feel better after the birth. 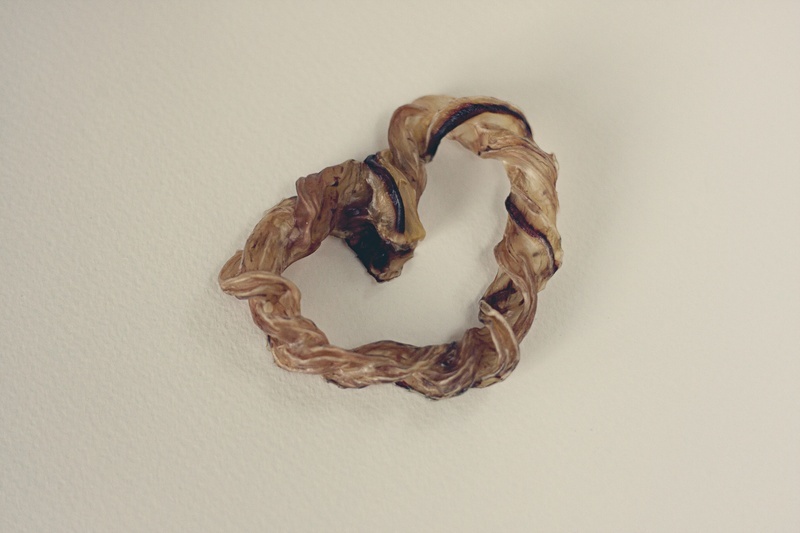 In Traditional Chinese Medicine the Placenta is considered as a powerful and sacred medicine full of life force"QI". It's said that the use of Placenta Medicine during the postpartum time helps you to recover faster from childbirth. The placenta is loaded with a variety of natural hormones. It is a source of iron, protein, enzymes and more. 80% of women suffer from the "Baby Blues." Baby blues is not considered a disorder by the medical community because the majority of women experience it , and because it will eventually regulate itself within a few weeks. Symptoms last the first few weeks and include: Mood instability, Weepiness, Sadness, Anxiety, Lack of concentration, and Feelings of dependency. ​the day of your birth and pick it up the next day. One visit prenatally, or phone consultation. On call 7 days a week around your due date. My own supplies for the preparation and cleaning. $170 pick up and delivery within 24 hours (recommended). ​ A $20 discount is offered to birth clients. 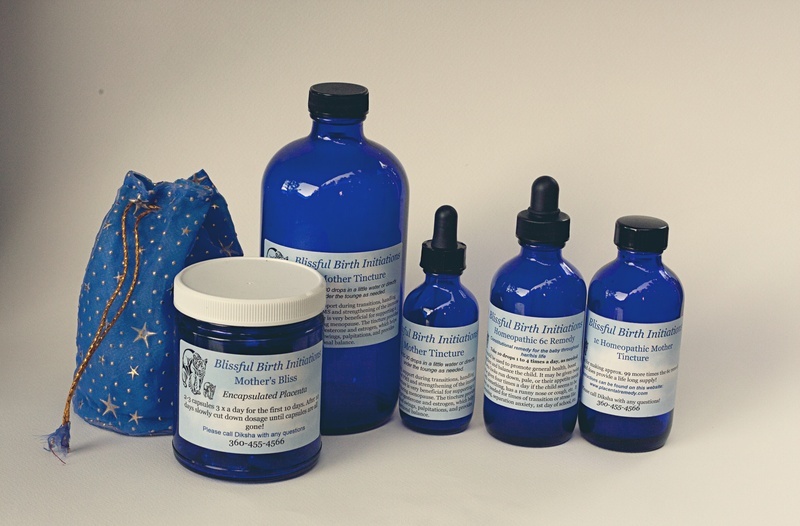 Two visits for the placenta encapsulation pick up and delivery of the placentawithin 24 hours from and to the location of your birth, or home. ​My own supplies for the preparation and cleaning. Two visits for the placenta encapsulation, at your home. 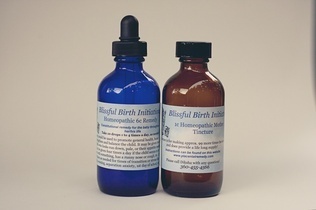 ﻿The Mother Tincture is a great remedy after the immediate postpartum time. The Mother Tincture can be helpful in stressful situations, low energy, feeling depressed or out of balance, transitions, PMS, and Menopause. I usually prepare 500 ml (16oz,) of the tincture and its recommended to take 20 to 30 drops as needed. If you are familiar with flower essences, think of the Mother Tincture working for your body like those. This tincture is preserved in 100% proof alcohol and can be stored for many many years to come. The process takes approx. 6 weeks! Homeopathic 6c Remedy is the perfect constitutional remedy for your baby. This tincture is preserved in 80% proof alcohol and can be stored for many many years to come. The theory is, that having a remedy at hand for your baby that is made from her placenta is like having a bit of a magic potion for the baby. A remedy to use at times of illness, shock, transition or change and when you intuitively feel to. The homeopathic remedy comes in one 100 ml bottle of 6c remedy and a 100ml bottle 1c mother essence which will make a life long supply. Its recommended to take 10 drops as needed. 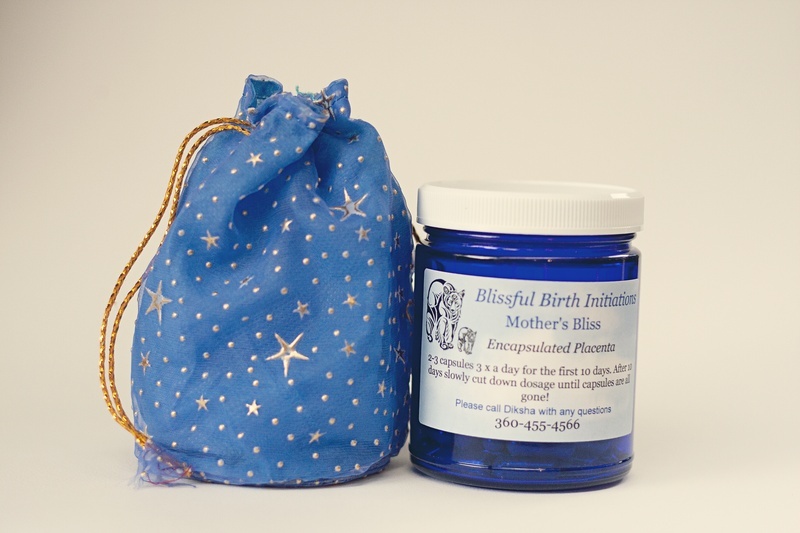 I began my official training in placenta encapsulation in 2009 and have prepared over 500 placentas since then. I use the Traditional Chinese Method in which the placenta gets first steamed, then sliced and dehydrated before it gets pulverized and encapsulated. The process of steaming the placenta is in TCM an integral part of formation and action of the medicine. Depending on the size and consistence you may get 140 to 180 "0" sized capsules from your placenta. from your placenta. The Raw Method can be very energizing and is not always recommended. Please contact me before the birth to let me know your estimated due date, the intended birth place and to schedule a meeting. This gives us a chance to talk more into depth about the encapsulation process, the benefits and dosage. Also, this way I don't have to disturb you with questions and too many explanations during your babymoon. I will either come to your home for the encapsulation process or pick up your placenta at an agreed upon location. Either way I will use my own equipment and follow strictly OSHA guidelines during the preparation of your placenta. Best results will be obtained if the placenta is prepared within 48 hours or so of the birth. The entire encapsulation process will take two visits and is finished within 24 hours, including preparation, drying, and encapsulating. Your placenta is prepared using ONLY and ALL sterilized equipment! Diksha encapsulated my placenta and made an herbal remedy for the baby. She was such a pleasure to work with!! She understood my specific needs and worked to help me in every way she could. She has such a loving and easy going personality, exactly what anyone would want during such an important time. I felt like her only client, always having her undivided attention and support. I couldn't recommend her enough! I started the pills the day I received them ( just a day after birth). I also had a huge abundance of milk, I'm not sure if that was the pills or just my body, but the milk was definitely there! After the pills ran out, I started taking the tincture. The very first time I had such a burst of energy that I cleaned the whole house! I continue to take it when I am lacking energy, feel emotional, or feel out of sorts. I LOVE the tincture probably take it more often than the average person, but I feel that it really balances my mind and body. At four months old I gave Little V her first cold. We used her homeopathic remedy and it seemed to knock most of it out. She only had a bit of a runny nose after, but no cough or sneezing. We have also used it a few other times when she was not herself or a change was happening. I am anxious to see it work as she gets older. I cannot say enough good things about the Placenta Medicine. In all honesty, I could barely look at a picture of a placenta without getting a little queasy, but as I learned about it's amazing properties, I now see it as a life source and a life saver. I truly believe that it saved me from PPD, and it let me enjoy the new life that we had just brought into this world. ​I'm sorry that I haven't emailed sooner to let you know how everything was going with the placenta capsules and tinctures. They are amazing! Sadly I ran out of the capsules quite awhile ago but the tinctures have been very helpful as well. My little one, has never been sick thanks to hers! A couple times when her dad had a cold (I never got it, I attribute my tincture :) ) she started to get a little cough so I gave her a few drops a couple times a day and she was healthy as can be! Also, I occasionally get cold sores. I can't take the medication I have for them right now because it affects my milk supply. When I got one I decided to take my tincture to see if it would help. It did! The cold sore was gone in about 4 days, usually it takes about 10! The placenta is SO amazing! Thank you, thank you, thank you! ​Can't tell you how amazing the past two weeks have been. This has been the best post delivery experience I have ever had and I attribute it all to the placenta pills. I feel completely like myself! All my family - especially my husband has commented on how calm and relaxed I am, which is a huge change from the anxiety I've had with my other two. I can't tell you how grateful I am for this amazing service you provide! It truly is amazing and I will most definitely be telling all my friends. Thank you for your passion and desire to care for women at this pivotal time in our lives. It truly is a labor of love and I could not be more grateful. Thank you! Thank you! Thank you!